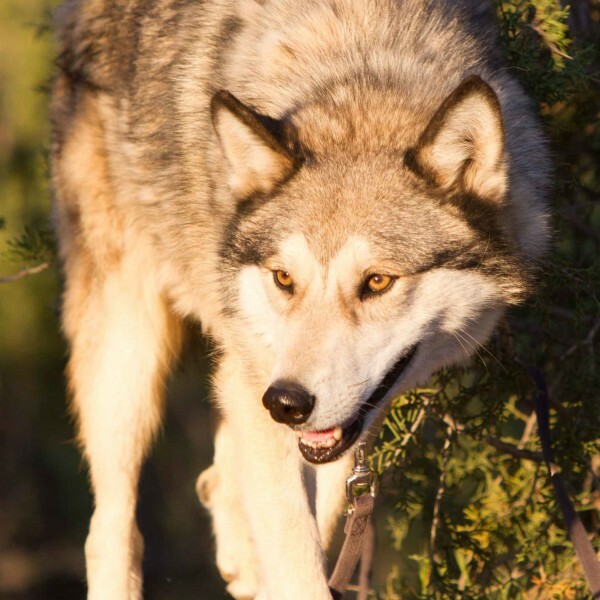 Every member of the Wolf Connection® Pack has a story to tell … all of them have been rescued, victims of a wide variety of situations, from abuse and neglect, to owners going through hardship and life changes, to conflict in animal regulations and law. 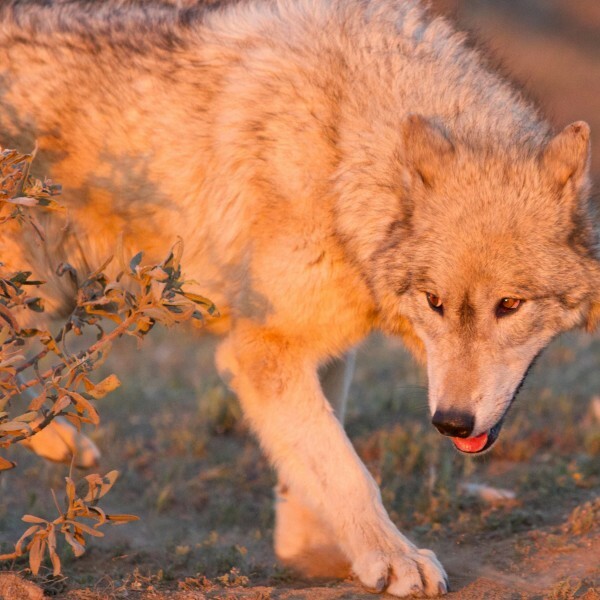 Whatever the case, these magnificent and special beings come to Wolf Connection® to find and embody a new purpose … a life of service, changing the lives of countless young men and women from all walks of life. Please take a moment to read their stories and connect with the magical being each of them is. You can also come and meet them in person at our monthly “Community Hike with the Pack” and you can always help with care of that wolfie that touches your heart in a special way by adopting them and enjoying special one-on-one time with your special friend. 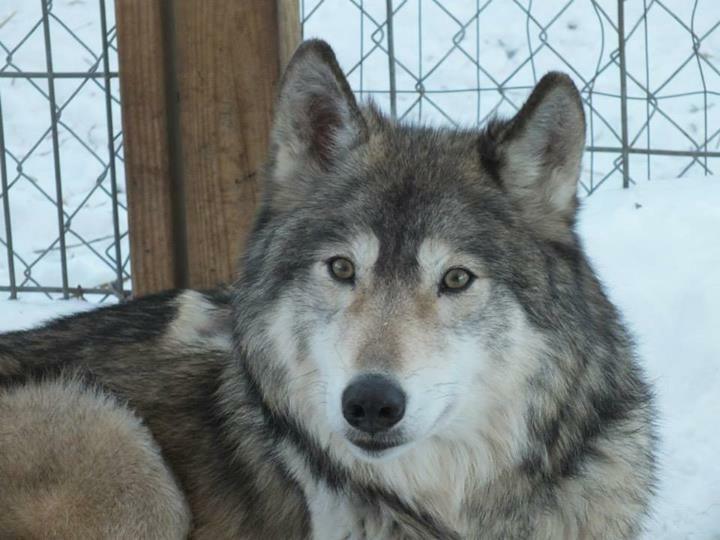 Annie and her siblings were found with 15 wolfdogs being bred on a fur farm in Illinois. When the State of Illinois closed the fur farm down for animal cruelty, Annie and her pack were slotted for euthanization. Rescues and zoos from across the nation came together to place these 15 feral wolfdogs, but Annie and her siblings, Charlee and Bella, were left with no home. 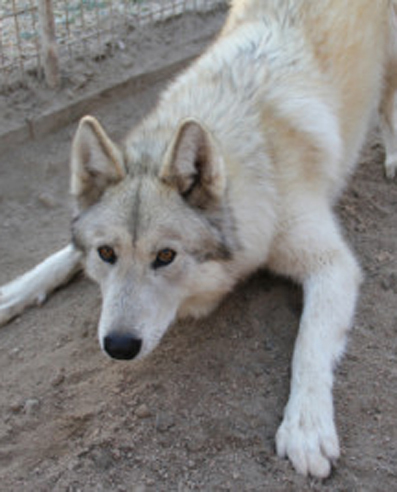 With no socialization, Wolf Connection® has undertaken a long process of physical, mental and emotional rehabilitation for Annie and her sisters. Annie has proven to be the bravest and most curious of the 3, a natural Beta, eager to meet new people and explore her environment. “Little One” in Cheyenne, Ayasha is one of our main program animals and loves to interact with people. She survived the snowy mountains of Northern California for 2 weeks alone before animal control was able to lure her with a piece of pizza! Being the sweetheart that she is, she won the hearts of the shelter employees there who, making every attempt to save her life, found Wolf Connection®. Ayasha loves to wrestle with her best friend Beau and pose for pictures at events. She is a star at school presentations when she howls for her audience! Bandit, an original pack member, is high energy, good-natured and very playful. Packed with attitude and known as the James Dean of the pack, given the opportunity, he will run around and rile up the rest of the pack! Often when teenagers come to Wolf Connection®, they really enjoy Bandit because he is outspoken and spunky. 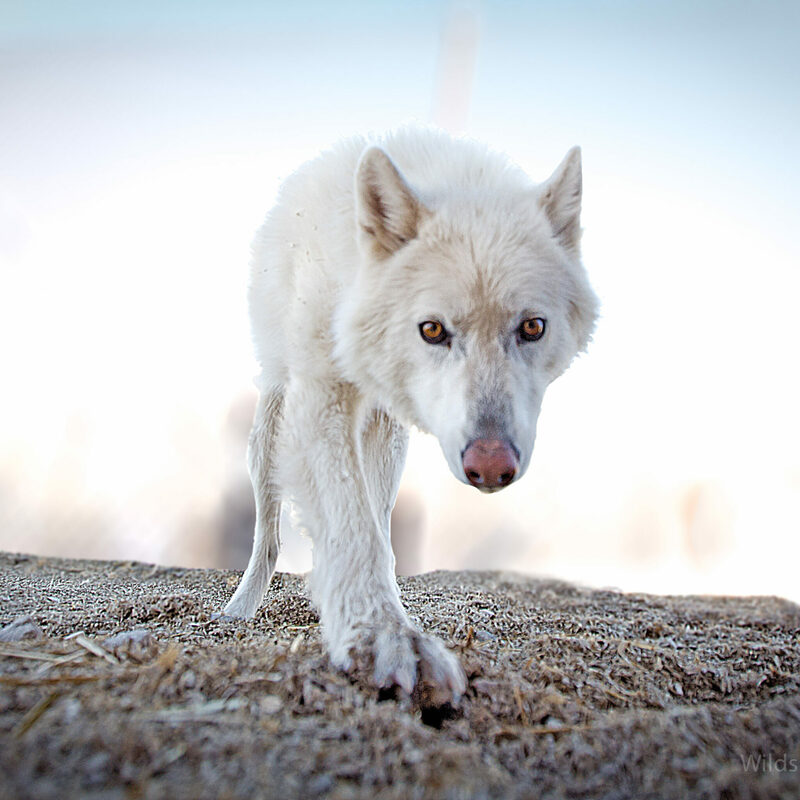 When training new volunteers to feed the wolves, Bandit is the first lesson – because he will generally challenge new volunteers by refusing to sit when asked…. He inspires tons of smiles. Beau is our gentle giant, who displays behavior of an Omega. He is very intelligent and playful; the clown of the pack, knowing how to win the approval of the more dominant members. Beau belonged to a family that experienced difficulty in giving him what he needed to be a healthy, happy wolf dog. No longer feeling they were able to care for him, they called Wolf Connection®. When the team arrived to pick up Beau he was emaciated and had a neck wound as a result of having been tied to a tree with a wire. Needless to say, he was extremely timid, but when the team opened the truck door, he flew in faster than the speed of light. With the love and care from his human pack, Beau has blossomed into the beauty he is now. He is friendly and loves going on adventures as one of our main program animals. He wins the hearts of many guests. His quiet, calm presence is helping Bella learn to integrate into the pack. Bella and her siblings were found with 15 wolfdogs being bred on a fur farm in Illinois. When the State of Illinois closed the fur farm down for animal cruelty, Bella and her pack were slotted for euthanization. Rescues and zoos from across the nation came together to place these 15 feral wolfdogs, but Bella and her siblings, Charlee and Annie, were left with no home. 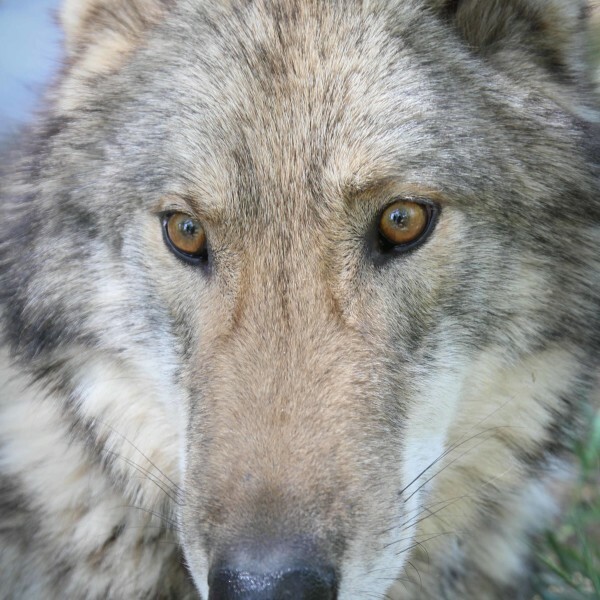 With no socialization, Wolf Connection® has undertaken a long process of physical, mental and emotional rehabilitation for Bella and her sisters. Bella has proven to be the shyest of the 3, a true Omega. Bella is learning the joy in playing in water, rolling in grass, and running around trees. Charlee and her siblings were found with 15 wolfdogs being bred on a fur farm in Illinois. When the State of Illinois closed the fur farm down for animal cruelty, Charlee and her pack were slotted for euthanization. Rescues and zoos from across the nation came together to place these 15 feral wolfdogs, but Charlee and her siblings, Bella and Annie, were left with no home. 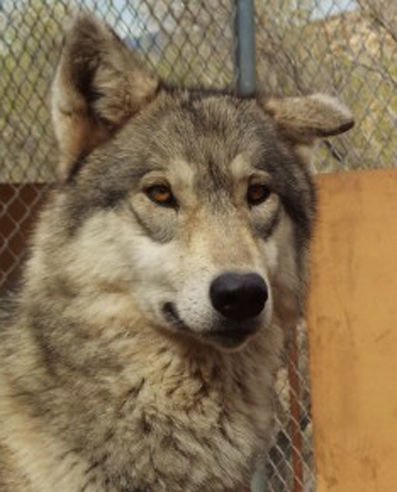 With no socialization, Wolf Connection® has undertaken a long process of physical, mental and emotional rehabilitation for Charlee and her sisters. Charlee has proven to be the most thoughtful and patient of the 3. Charlee is learning the ways of the wolf by watching Maya, the Wolf Connection pack’s current alpha female. Jacy is rambunctious, full of energy, and is in training to become a great program animal. 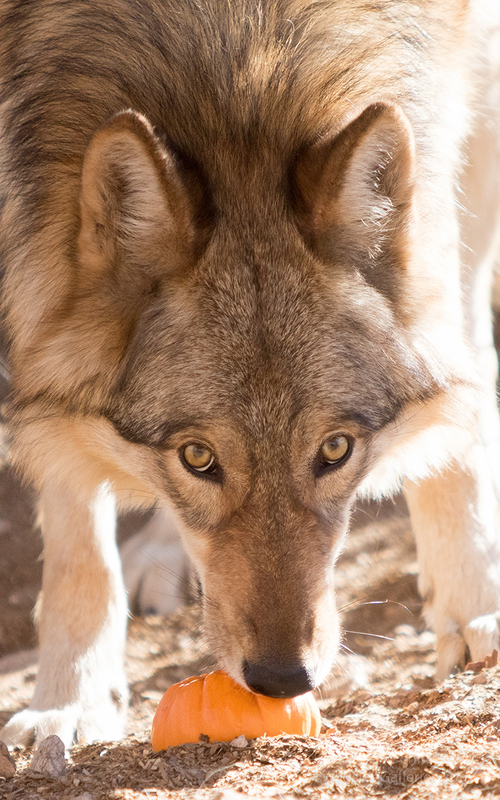 Having escaped a shelter twice, Jacy changed the course of his life by buying time and giving Wolf Connection® a chance to find out that he was in need of rescue. 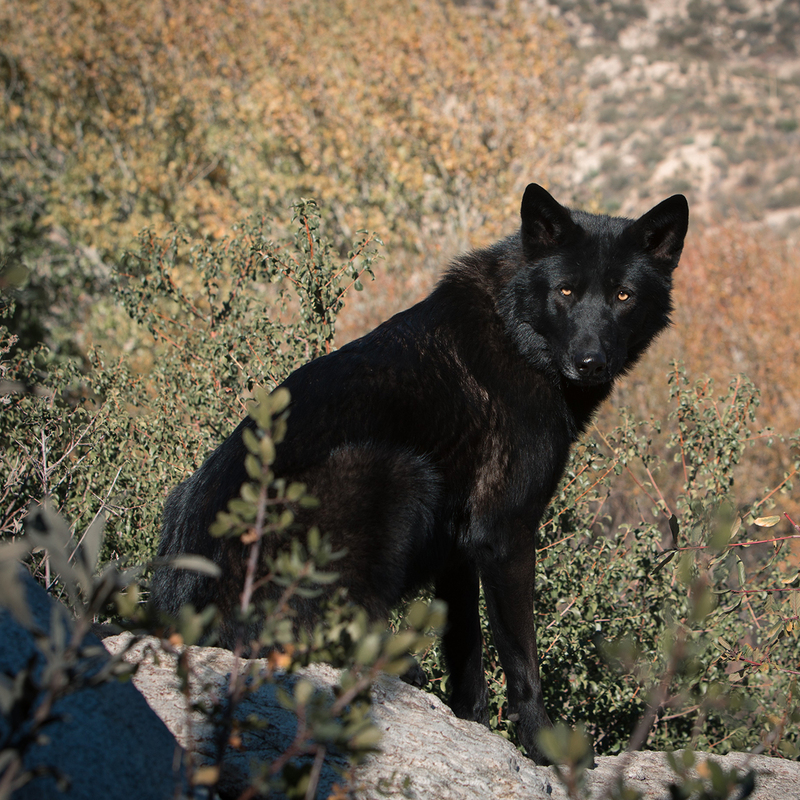 On the very same day he was rescued, one of our packs elders named Moonshadow passed away. 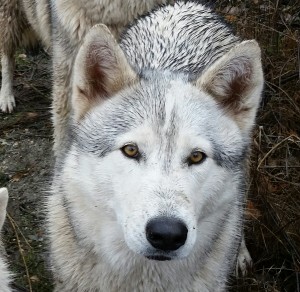 Staff decided that in honor of Moonshadow, the new wolf dog would be named Jacy, which means “moon” in Native American. Jacy is working through his anxious personality. He teaches guests to honor the healing process by watching Jacy accept support from the staff who handle him as he works through his fears of meeting new people and braving the hike despite the anxiety. 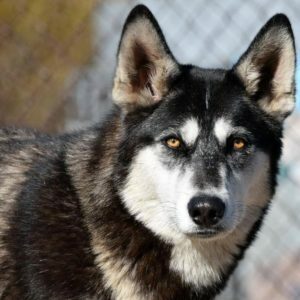 Kenai’s story is the prime example of why about 80 percent of wolfdogs in the United States are euthanized by the age of three. A family who owned what they previously thought was a high content wolf dog, but was really a low content wolf dog, requested “another” high content wolf dog from their breeder. Along comes Kenai: a true high content wolf dog who proceeded to eat part of their house and even some of the vacuum cleaner, for example, because he was bored or his bonded human pack member was not with him. 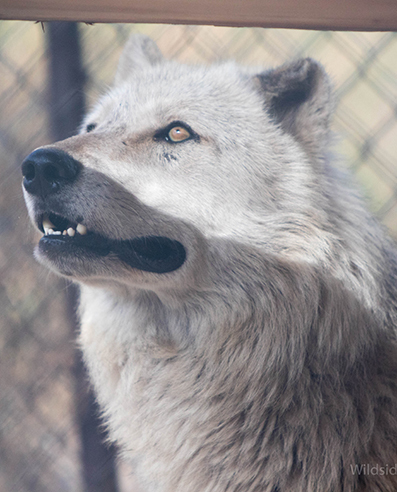 Though he was greatly loved, the family decided his life would be better at Wolf Connection®. As a high content, Kenai is very shy around new people. It takes time to nurture a relationship with him. What a privilege it is to gaze into his golden eyes once he begins to trust. The journey to bond with Kenai is one of patience and nurturing. Luna was originally rescued from a backyard breeder who was “going out of business”. Rescuers heard that the mother and puppies (Lunaand siblings) were in poor condition and stepped in. At just 3 and a half weeks old, they were removed from the person, the mother was rushed to ER as she was so malnourished, she couldn’t nurse or care for Luna and her siblings. Luna was then fostered at another sanctuary where she and her siblings were bottle fed and nursed back to health. 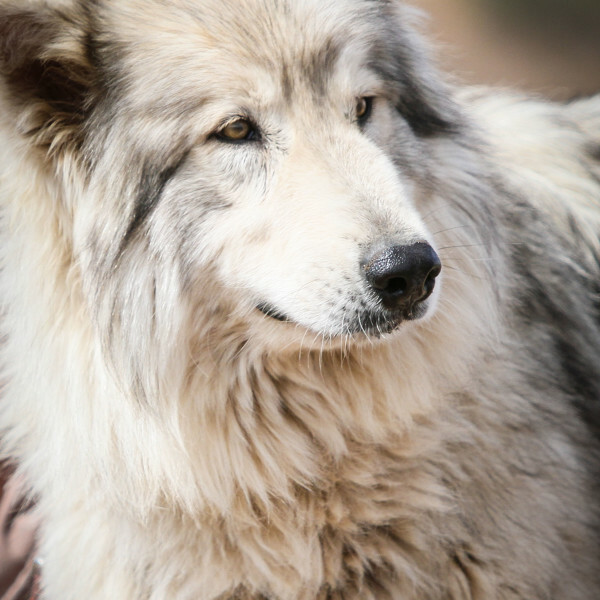 When Luna was 2 months old, this sanctuary asked Wolf Connection® if she could join our pack. 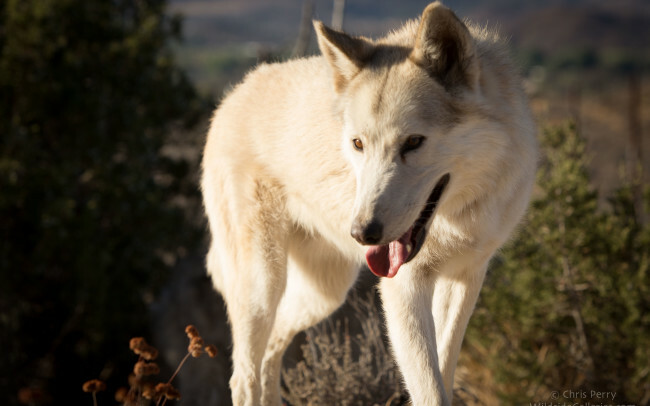 As Luna continued growing and her health strengthened after such a rough start, she soon became one of our ambassador wolfdogs with the rest of the pack, partaking in programs and monthly community events. Having lived the first year of her life underneath a porch, Maggie was rescued and kenneled at an east coast wolfdog rescue where she was brought to health and spayed. Maggie ​was then taken ​in​to​ the care of a military couple, who would become Maggie’s owners for the next 4 years. 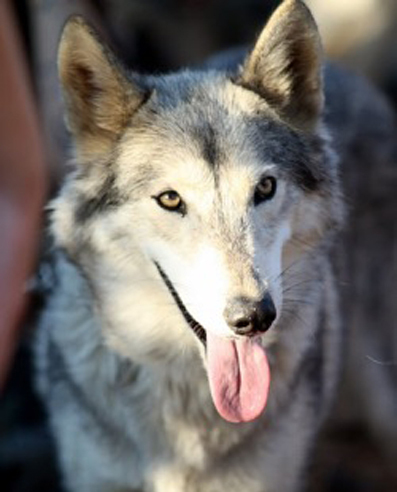 ​At 6 years old, Maggie’s family ​was deployed ​and Wolf Connection® was honored to help Maggie in her continued healing as a wolfdog – to begin a new life with a safe, healthy pack that can be trusted and bring infinite joy. Maggie has found her life partner in Koda and the two couldn’t be more perfect for each other. Malo is an energetic pack member. At the owner’s dying request, a hospice worker agreed to adopt him. Though well loved, Malo challenged the neighborhood with his howling and escapades. 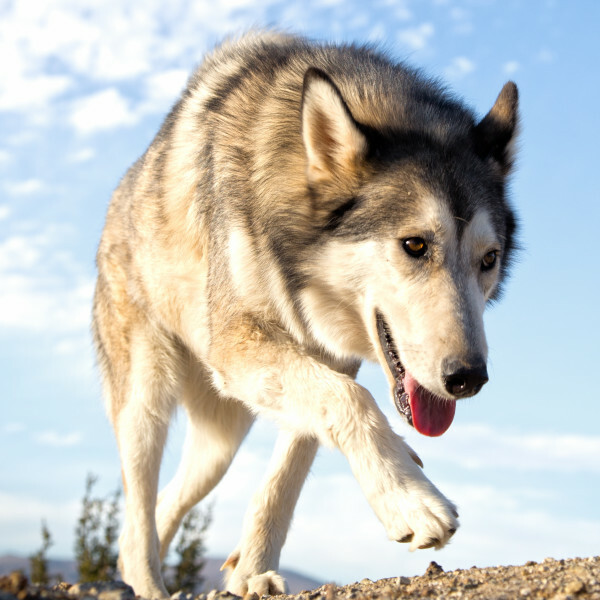 After Malo escaped to chase a few chickens and threats came in from the local community, the owners feared for his safety and found Wolf Connection®. When he first arrived, Malo assisted with the training of new volunteers. He liked to block new volunteers from leaving his kennel. Because his previous owner had encouraged him to wrestle, it was a challenge to new volunteers to assert themselves and sufficiently ignore his poor behavior so he would lose interest and they could easily exit the kennel. Malo is well loved and is now feeling the karma of his past behaviors as Charlee loves to wrestle even more than he does! 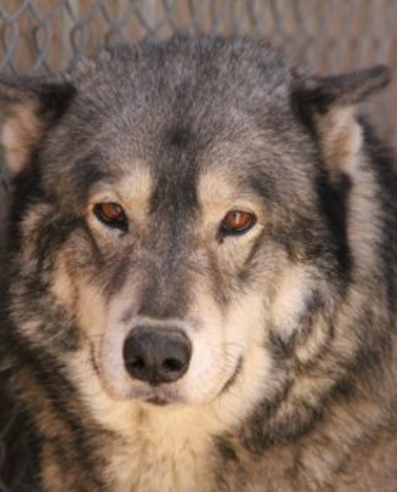 Max was a gift from a father to his nineteen year old son who had begged for a wolf dog. Unfortunately, the family was not prepared for the amount of training and attention required. Max is very shy, skittish and intelligent…..Without enough attention, he did some creative landscaping of the yard and remodeled the back wall of the house. 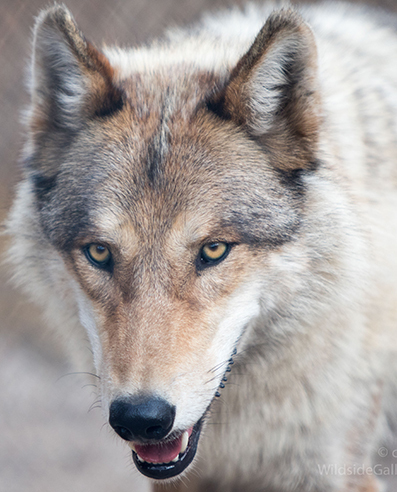 After jumping through a glass window to get inside the house, the owners reached out to Wolf Connection® for assistance. Max became a pack member and the son became a volunteer! Max continues to work through his shy personality while continuing to be his playful, mischievous self. 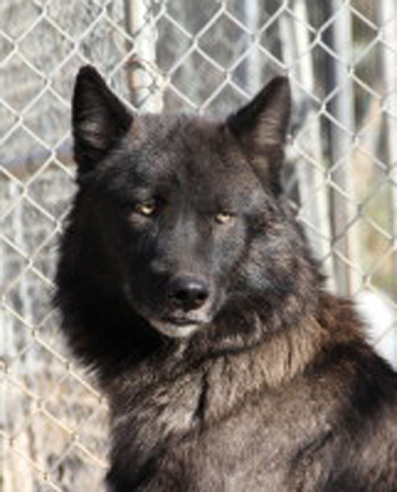 Mikey is a rather shy wolf dog whose owner surrendered him due to failing health and finances. When he first arrived, Mikey was visibly frightened. He is slowly developing relationships with staff through one on one “Mikey Medicine” and hikes, which he loves! Mikey has a very gentle side to him. 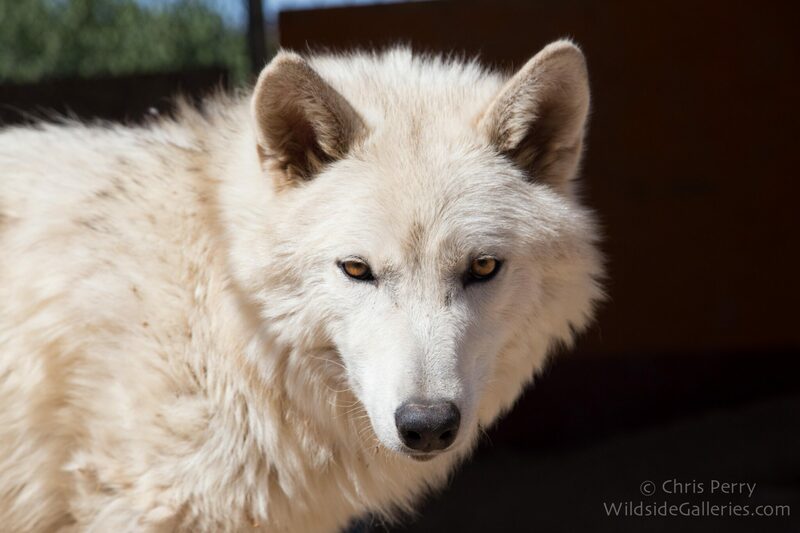 As we continue to get to know him, we are excited to see a sweet, confident side of Mikey which is helping Warrior Annie learn to peacefully co-habitate with another wolfdog and better control her impulses. Picked up as a stray by animal control and identified as a coyote/wolfdog mix, Nali sat alone in a local Arizona shelter awaiting her owner. Unfortunately for Nali, her owner did not have the appropriate permits to keep her and, when faced with several fines, abandoned Nali to the “high kill” shelter in Maricopa County. But the shelter gave Nali a fighting chance by contacting the Southwest Wildlife Conservation Center who removed Nali from her fate and sought out council for a permanent sanctuary for Nali. 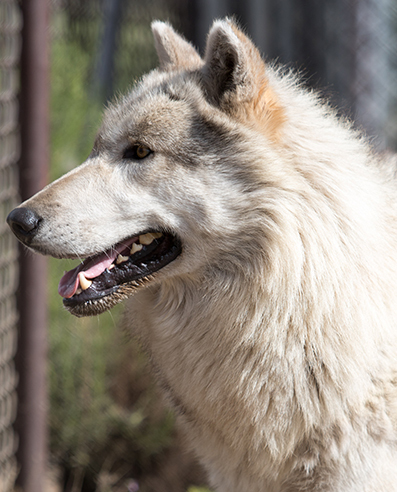 Wolf Connection® was their number one choice where Nali would thrive and live out the rest of her life with full enrichment and a pack of her own. We were honored to have been chosen! Neo was found in a shopping cart by an eighteen year old boy who begged his parents to be allowed to keep him. Neo is shy, curious and full of energy. Mostly, Neo likes to have friends. Neo kept escaping from the young man’s house and yard and would run over to play with the neighbor’s German Shepherds! Finally, tired of the complaints, the parents told their son to get rid of Neo. When they tried to turn him over to the local shelter, luckily for Neo, the woman working at the shelter knew that Neo would soon be euthanized, so she asked the family to keep him until she could locate a sanctuary for him. Wolf Connection® is happy to have him! He is beginning his training to become accustomed to working with staff and eventually, perhaps the public. And yes, he already has a few friends with which he plays and snuggles with like a true pup of the pack. Nova is gentle, shy and skittish, and yet warmly sweet and playful as you get to know her through patience and bonding. 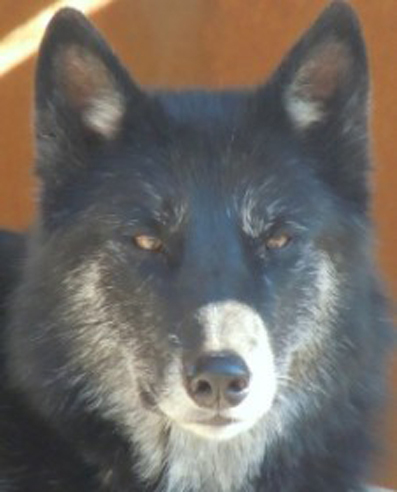 She lives with Tala and Wyoh and is also a well-trained and beloved ambassador of Wolf Connection®. Nova teaches guests to respect boundaries because though she is well trained, her shyness warrants allowing her the space that she needs. When she is ready, she will approach to interact with such curiosity, and even some silly wiggling and play pounces…..Usually when one least expects it. 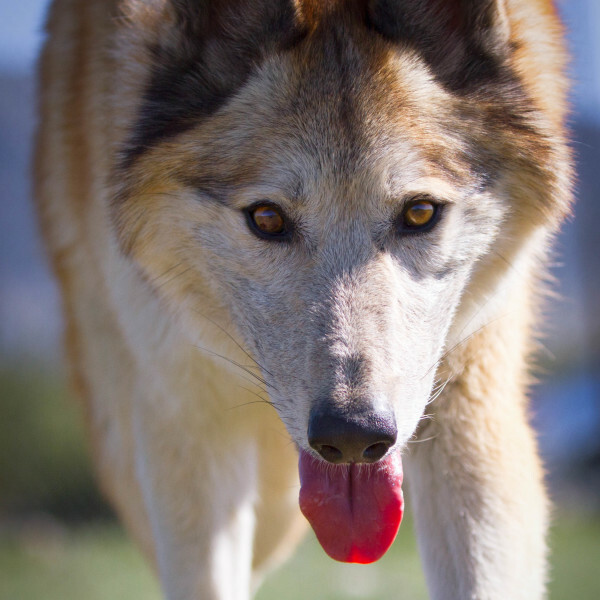 Wolf Connection® received information that an “enormous mystery dog” was held at a shelter in Sacramento, CA, and that they were searching for the owner. Despite the press and outreach, no one stepped forward as the owner of this gentle giant. Pictures of this guy lit up excited debates about what kind of dog he could possibly be with the final consensus being that this 120 pounder must have jumped right out of Game of Thrones. After seeing the pictures, Wolf Connection® knew right off the bat that the “mystery dog” was not the average dog! 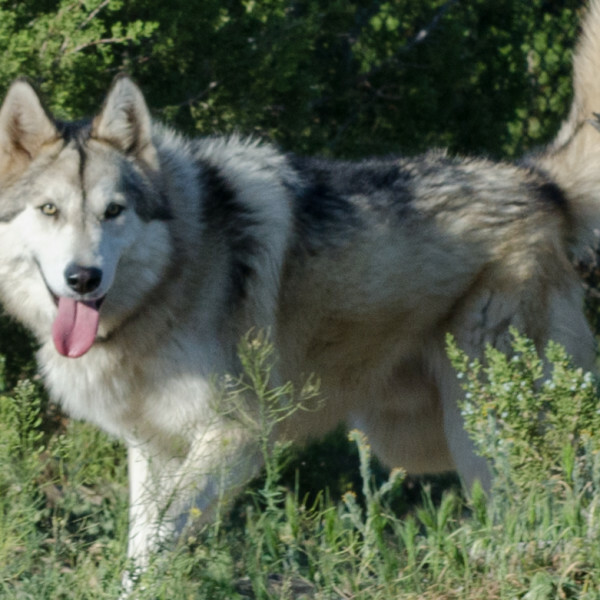 After researching our website and talking with us about our purpose and programs, the shelter’s manager decided that Wolf Connection® was the best place for Ranger to have a well-balanced life. After a good bath and cleaning out the mats in his long fur, he made it home to Wolf Connection®. Ranger loves everyone and he seems to understand how regal he looks with his luscious locks of fur that makes him stand out from the rest. He has become a highly regarded program animal. 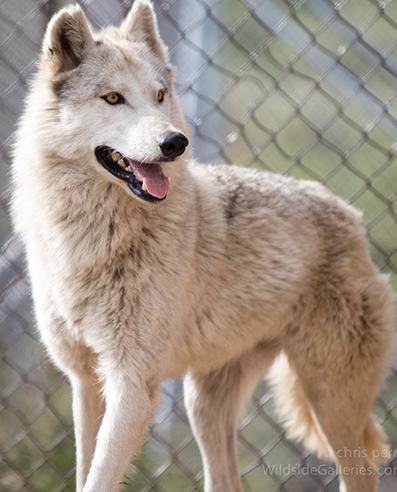 Ryder joined Wolf Connection® at the age of just a year old. A young woman adopted him after seeing a post on Facebook that someone was going to take him to the shelter. Knowing that he would be euthanized, the young woman took him despite warnings that she would not be able to contain him. Ryder escaped many times and walked the neighborhood until the neighbors began complaining. 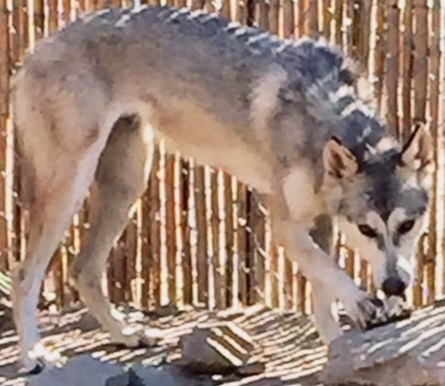 After threats from neighbors and complaints from Animal Control, the woman asked Wolf Connection® to take him in. Ryder is young and spunky. He has a very sweet way of gently jumping up and placing his paws on staff…He has a way of doing so without much impact and he gives sweet kisses. When he is not acting that way…he is generally pushing boundaries and inciting mayhem with his habitat-mate, Neo. Shade was purchased as a puppy from a breeder by a young man in college. The young man worked incessantly to train him and Shade became a well behaved companion. But Shade continued to prove that he needed more than a large home to meet his needs – being a young wolfdog and having a lot of energy! Regardless of the nurturing and care he received in the home, Shade is still a wolfdog and proved his pack mentality. 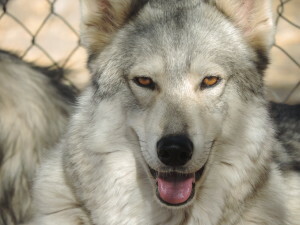 Shade’s family realized Shade’s heightened wolfdog needs and found Wolf Connection® as Shade’s forever home. Though Shade does not work directly with guests and clients, he teaches everyone who walks near his kennel about the importance of honoring the early stages of development with patience and calmness. Shade has settled in to his now forever home and is quite happy and grounded. He’s a very loving, loyal pup who loves to run on hikes with an endless supply of energy. Shadow joined Wolf Connection® after her owner passed away and her caretaker searched for a home for she and Sissy. Shadow is learning to trust people and is beginning to slowly open up and allow new people to interact with her through the fence. She loves to run and is actively bonding with volunteers, more and more each day. 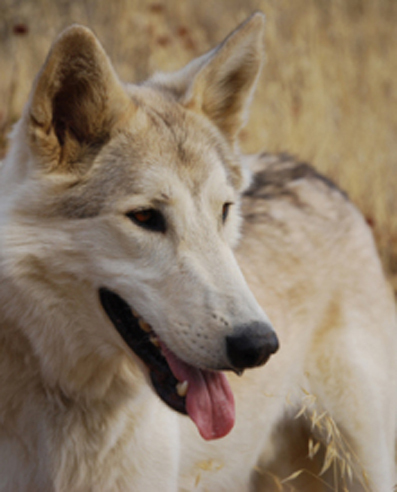 In the summer of 2012 Willow accompanied several Wolf Connection® staff and wolves to attend a sacred council of the Thirteen Grandmothers in Lame Deer, Montana. The Cheyenne adored her and felt blessed by her presence. Looking into her eyes, one may be inspired to see pools of honey, dripping with purity and sweetness. Her presence is palpable and though it may require patience before she will allow new people to pet her and directly connect with her, and the experience is well worth the effort. Evidence of her high wolf content, she is shy and intelligent. Guests who allow the lesson of patience and respect have been rewarded with petting Willow and gazing into her eyes. She has the instinct of a tracker and the understanding of an omega in that she knows how to keep peace – especially as her habitat-mate, Kenai, is developing into an Alpha! 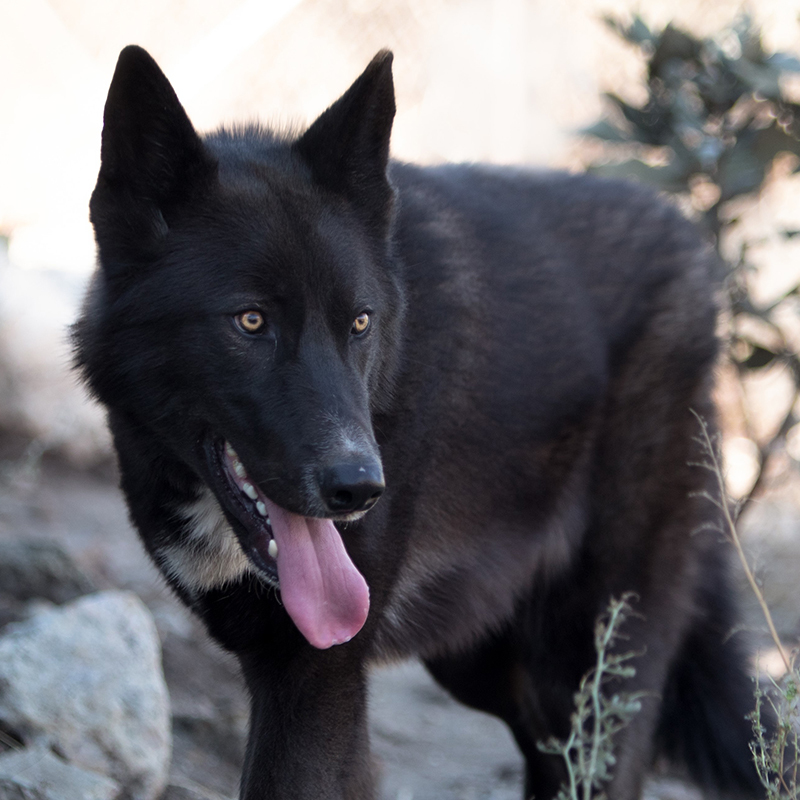 Arriving with his name and loving spirit, Wolfee joined Wolf Connection® as a result of being confiscated during a sting operation: he was being traded by his owners for drugs. Ironically, his very first program hike participation was helping people overcoming substance abuse. Wolfee freely gives kisses and loving attention and loves being with people, especially kids, resulting in “Team Wolfee”. 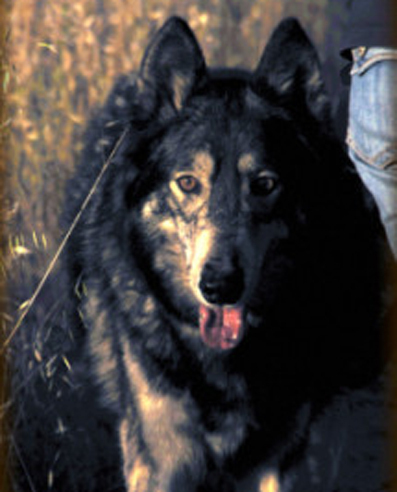 Wyoh, an original pack member, became the second wolf dog of Teo’s. Today Wyoh is one of the best-trained ambassadors, a main program animal and one of the most loving beings. He is sure to get endless belly rubs from anyone and sneak in a kiss whenever he can. He came from severe stress of a shelter and the loss of his sister to now, he has overcome tremendous anxiety and has found a great place among the pack as his family.